The following article was published in the New Rochelle Focus (nrfocus.org) on November 4th. 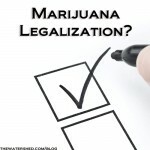 Marijuana-LegalizationSeveral clear, simple arguments for legalizing marijuana have gained traction with the public. Marijuana proponents assert it is less harmful than alcohol and, since alcohol is legal, it is hypocritical to market alcohol while marijuana remains illegal. They argue marijuana is already widely available, so legalization will have no impact on use or problems. Moreover, they predict legalization will unburden enforcement, court and penal systems while creating new tax revenues, providing a productive fix for the budget woes faced in many states. This argument for legalization is attractive but is legalization the right answer? As one who has spent the past 15 years following the published cannabis research, I am dubious. Half of winning a debate is getting to frame the context. Those advocating marijuana legalization frame it as a fairness issue by comparing marijuana to alcohol. This can be stated as, “You drink your glass of wine, why can’t I smoke my weed?” This is a false analogy equating alcohol, in any amount, to using in marijuana but the two are not equivalent. Most adults are not impaired on a standard drink consumed in an hour with a meal. This type of drinking can be readily observed in many restaurants. The majority of drinkers in the United States consume alcohol in small quantities for most of their adult life with negligible negative effects. A more accurate analogy compares marijuana use to drinking for a high. A person may have a cold beer after mowing the lawn to enjoy the taste and cool off with no intention to get even tipsy; the purpose of using marijuana is to get buzzed or high. There is no other reason to use it. Occasions of use are actually bouts of impairment. This distinguishes it from typical alcohol use and from a public health perspective is problematic. To frame the debate as marijuana versus alcohol ignores the actual question that must be asked: Is marijuana harmful to those using it? Legalization proponents argue marijuana causes fewer problems than alcohol but this is partly because far fewer people use it. The latest figures from SAMHSA’s National Survey on Drug Use and Health (NSDUH) show 4.6 million marijuana users were daily or near daily users, using 300 or more days in the past year, while those binge drinking alcohol at least once in just the past 30 days is a rate twelve times higher at 58.6 million people. Proponents note marijuana use has not greatly increased in states with medical marijuana laws but overt legalization communicates social approval of casual use. Many individuals won’t break the law to use a substance or lie to a physician to get a prescription so current availability is not a good proxy measure of what happens with increased social acceptance. With legalization, use rates are likely to shoot up, especially in our advertising-driven society where billions in corporate profits can be made by promoting its use. This is supported in a study of California legalization effects done by the Rand Drug Policy Research Center in 2010. Their studies suggest use rates would likely increase by 25% among adults with more new initiates, more regular users and people using for longer periods of time. With this rise in use comes increased financial and human costs. They would not speculate on what might happen among youth consumption except to say it would likely rise. No one aware of alcohol’s links to high-speed driving, fights, assaults and suicide, believes it is harmless; marijuana’s effects are not so dramatic but marijuana is not benign. Comparing it to alcohol masks marijuana-specific problems. Marijuana users report it helps them to focus attention but this is really a loss of ability to rapidly shift attention among multiple things. This diminished ability to shift attention is a problem when driving. Research finds those acutely under cannabis’ influence lose capacity to rapidly attend to the multiple factors required in driving, can impair perception and slow response times. These effects impair driving and create an increased risk for both crashes and fatalities. Its lingering effects include memory problems, impaired executive brain functions of problem- solving, prioritizing, planning and persistence to task completion and inflexible thinking, with persistence in erroneous problem-solving. Longitudinal studies found compared to non-users, marijuana users have poorer life outcomes including an increased probability of using other illicit drugs, being depressed, spending more time unemployed, with lower income and more likely to be single or divorced. With or without pre-existing psychopathology, the most powerful predictor of cannabis dependence at age 21 is the quantity and frequency of use at age 18. Long-term heavy marijuana users show reduced brain hippocampus and amygdala volume with increased sub threshold psychotic symptoms. These can include flat emotional affect, delusions, anhedonia, being more asocial or experiencing amotivation. Heavy users also exhibit a decreased capacity for verbal learning and more memory impairment. Cannabis also appears to act as an environmental risk factor for triggering schizophrenia in genetically predisposed individuals. Legalization would likely increase these public health burdens due to increased use. While legalization might decrease some social costs, particularly in the legal system, it is likely to increase other costs. Those favoring legalization often point out alcohol prohibition caused the rise of organized crime but fail to note organized crime did not vanish when prohibition ended. It simply moved to other “businesses.” We may see reduced costs in police, court and detention systems for prosecuting mostly misdemeanor possession charges, and yes, taxes could create new revenue. However, as noted from studies already cited, these benefits are likely to be significantly offset by increased regulatory bureaucracy, black market sales, increased healthcare costs, more demand for treatment of cannabis dependence and greater losses in economic productivity. We are also likely to see some enforcement and court costs increase with more impaired driving and more marijuana- related traffic fatalities. The latter is especially costly because not only does it incur the emotional loss to family and friends, it also robs society of all of the productive years of the individual who dies. These are frequently young adults, so the number of lost years can be enormous. Marijuana carries its own risks as a significant public health and public safety issue. To argue it does less harm than something else is a faint reason to legalize it. Our two legal substances alcohol and tobacco already incur more costs than they generate public revenue. Choosing to add another substance to that list, one that serves no function but getting high, invites still more social costs. Like its predecessors, legal marijuana is unlikely to pay its bills and monetary gains will not undo the health, cognitive and relationship problems it incurs. Our current problem is not with marijuana laws but with marijuana use. Increased public awareness of the risks more recently clarified in the research along with tailored prevention and treatment efforts to reduce use are likely to be more cost-effective. Since it would further damage public health, burden healthcare and treatment systems with preventable problems and undermine individual well-being, legalization is an answer that is clear, simple and wrong. Allan Barger, MSW, is a Research Analyst at Prevention Research Institute who reviews peer-reviewed research on drugs, brain and behavior and trains professionals working with drug clients. Barger is a member of the National Association of Social Workers, the Research Society on Alcoholism and the New York Academy of Sciences. Contact info: www. primeforlife.org or allan@askpri. org. A version of this article originally appeared in the May/June Edition of the NAADAC News. Next Post Link to Parent Survey About HS Students’ Issues – Please Participate!